It finally happened. Facebook changed the like button. After years of people asking for a dislike button, Mark Zuckerberg has given the world a new way to react to posts on the social network. In many ways, the like button had come to define Facebook and the kinds of posts that populated its newsfeeds. Many speculated that the like button was beginning to pigeonhole Facebook’s content into simply positive posts, and it was becoming a place where more serious news felt out of place. Indeed, networks like Twitter and Medium have become more culturally important when it comes to more purposeful journalism, a reality that Facebook has been trying to change since they released Instant Articles last year. So, while some are nitpicking the new reactions for not being “linguistically related,” they are meant to cover a broader range of feelings. Or it may just leave users feeling empty when their friends are simply liking their picture instead of loving it. At this point, no one is doubting Snapchat’s potential as a social network. It has over 100 million daily users and is a crucial social network in the lives of younger millennials and their juniors. Its influence and import was originally set at $16 billion. And if that seems like a lot, that’s because it for sure was; very recently Snapchat’s valuation fell to a pitiful $12 billion. While that seems a high value for the app, Snapchat is beginning to prove its worth. Last week, it was announced that Snapchat was partnering with Nielsen Ratings to track ad campaigns. Since its initial monetization, Snapchat has struggled to attract advertisers who pointed to a lack of tracking and accountability, among other things. The move should make it much more attractive to more brands who will be able to measure the return from their investment. Remember Foursquare? It’s the app that allowed users to check in to any location in the world in an effort to be elected mayor there. Well, over a year ago, Foursquare changed its app entirely, splitting into two: Foursquare and Swarm. Swarm functions as the Foursquare of old. The new Foursquare is a restaurant and service rating app (think: Yelp) that utilizes location data and personal preferences to recommend restaurants and experiences. Now, Foursquare is announcing that it has a tool that can attribute foot traffic to digital ads. Traditionally, advertisers have had to wait months for credit card data to sync with ad campaigns to measure success. But with their new tool, Foursquare could potentially change the whole system. Foursquare tracks users locations thru location services, so if it shows a user an ad from Bloomingdales and then that user walks into a Bloomingdales later that week, it will show up in Foursquare’s new tool immediately. Of course the whole system relies on users to turn on location services, which may not pose a huge threat as so many are unaware of the degree to which phones know where we’ve been. Curious what that degree is? Check out “Frequent Locations” on your iPhone, if you can find it. Check out Foursquare’s Vimeo page for a look into the power and insight of their location data. It features maps that measure the pulse of the world’s biggest cities as users go about their day (the image at the top is London). Here is a day in the life of San Francisco. Originally starting as an email newsletter highlighting the best restaurant and bars in local cities, Thrillist quickly expanded to become a men’s lifestyle resource that provides recommendations on a variety of topics including food, entertainment, travel, and health. The site has local coverage in over 40 US cities and reports on national stories, like the Oscars or Facebook’s new reactions. Thrillist partners with brands to create purposeful content that integrates brands into the site, while still staying true to their voice. This content creation has proven to drive great results for brands with 85% of Thrillist campaigns outperforming category benchmarks in generating purchase intent. Behind-the-scenes photos have always been coveted by reporters as they try to scrape together their wrap-up stories for big live events, but with phones being in the hands of the actors and the people that surround them, they’ve become more than willing to share on their own. The personal view we get on Instagram and Snapchat from before, during, and after the show gives fans full immersion into what it’s like to be there. The most intimate and humanizing photos actually come before the show even starts where the stars are without makeup and just getting their day going. 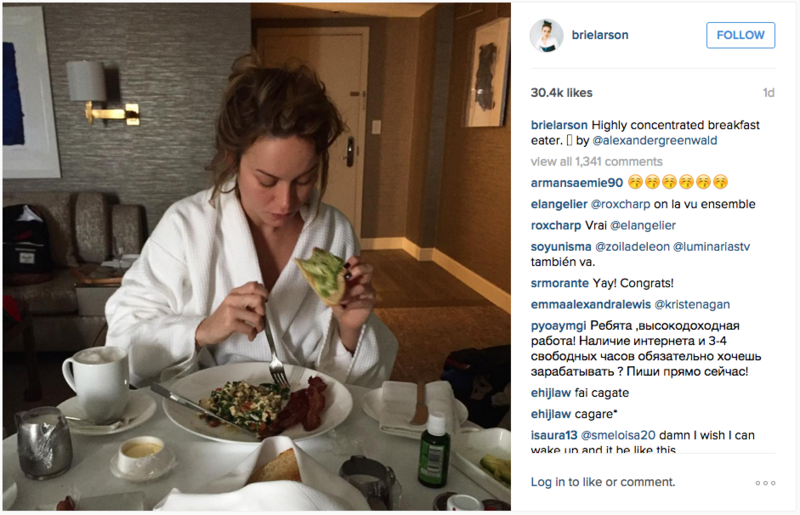 A few great examples include Reese Witherspoon getting prepped, Brie Larson noshing her breakfast before getting ready, and Chrissy Teigen revealing to the world that she’s actually being sewn into her dress. These once rare moments are more than happily shared across social channels giving fans a sense of realness to the whole affair.